This blog has two authors: Barbara Kaiser (the expert in children’s challenging behavior] and Judy Sklar Rasminsky (the writer). We each have two daughters born 7½ years apart, and we met because we kept running into each other at our local school, playground, and swimming pool. We realized we must have a lot in common, and we have been fast friends and collaborators ever since. Barbara became interested in early childhood care and education while she was a new mom teaching English in rural Quebec, Canada. She thought she could make more of a difference by focusing on younger children, so she founded and ran the province’s first government-subsidized nonprofit child care center for farming families. Later Barbara moved to Montreal, had a second child, did a masters degree in educational administration at McGill University, and started another child care center. Challenging behavior became her specialty when 2½-year-old Andrew walked through center’s front door. He brought out every flaw in the program and taxed every skill the experienced and qualified staff had developed. Barbara vowed she would never let this happen again and set out to learn all she could about challenging behavior. 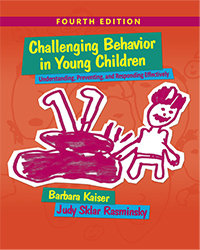 The result (with Judy’s collaboration) was three books for teachers: the bestselling Meeting the Challenge, Challenging Behavior in Young Children (now in its 3rd edition), and Challenging Behavior in Elementary and Middle School. Barbara also became a consultant for Mr. Rogers’ Family Communications Inc. and the Devereux Early Childhood Initiative, where she worked on “Facing the Challenge,” an instructional DVD based on Challenging Behavior in Young Children. She now travels the world giving workshops and keynotes on challenging behavior. Judy’s first published work appeared in her elementary school magazine, the Melrose Messenger. After graduating from Stanford, she earned an MA from Columbia and began writing and editing books and articles. Her work (with and without Barbara) has won several awards, including the prestigious Texty, which recognizes textbook excellence. When her children started school, Judy volunteered compulsively, and Barbara had no trouble persuading her to head the board of directors of her new child care center—and to enroll her younger daughter. Judy immediately became a child care groupie, and with Barbara as coauthor wrote The Daycare Handbook (a parents’ guide to choosing child care) and several publications for the Canadian Child Care Federation. We are currently collecting material for the fourth edition of Challenging Behavior in Young Children. We’d love to hear what you have to say about children with challenging behavior. Please comment on our blog!